For companies with busy and cramped product lines, there is always a drive to improve their technology. By using better, more efficient equipment, manufacturers can keep up with increasing demands and improve conditions inside their facility. At Kodiak, we offer a selection of Unitronics terminals and programmable logic controllers (PLC). These high-quality products are among the most sought-after pieces of equipment in the industry. With a compact, all-in-one integrated operator interface, this product provides the benefits of a single operating panel and PLC controller with less wiring needed. Unitronics PLCs feature an integrated Human-Machine Interface (HMI) with easy-to-understand and use digital screens. Companies can pick and choose from a diverse selection of PLC product lines. Each offers features dedicated to meeting specific needs from the simple and traditional industrial i/o to cutting-edge customized designs. Our PLCs are also available with a wide variety of screen sizes and capabilities. Included with your equipment, at no extra charge, is an all-in-one programming environment and utilities suite. 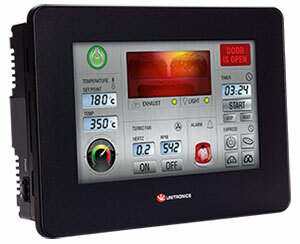 Configure communication and hardware, and Ladder and HMI applications inside of intuitive, easy to understand software. Unitronics has also developed software to support IoT and Industry 4.0 applications. In the 30+ years that Unitronics has served as an international provider of manufacturing controls, they’ve been recognized with numerous awards. For five years running, Unitronics received the “Engineer’s Choice Award” from Control Engineering. The company also received a “Best Practices Award” from Frost & Sullivan in 2016, and a “Golden Mousetrap” Award in the same year. As an industry leader ourselves, Kodiak Controls is pleased to be a provider of Unitronics products. For more information, please contact us. One of our knowledgeable representatives will be happy to schedule a free consultation with our experts. Manufacturers have to keep track of many elements during production or, even, to just maintain their facilities. Sensors are the devices that make it possible to keep track of everything remotely, efficiently, and to automatically make adjustments based on the data gathered. Kodiak Controls strives to provide industrial and manufacturing companies with the well-made level control and flow sensors they need to remain effective and productive. Our selection of GEMS sensors are useful in many industries from food to medicine to HVAC. 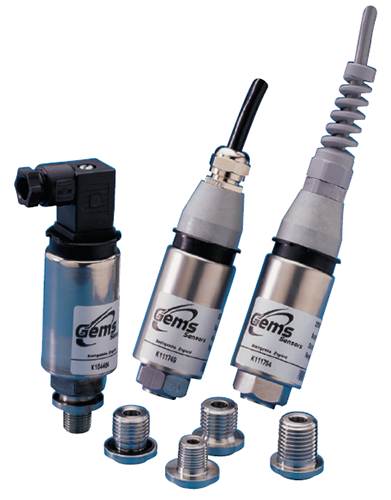 GEMS Sensors & Controls is a brand that has been around since 1955. It is recognized for the production of a wide range of custom engineered sensors and large manufacturing volumes. You can turn to this brand to produce ten thousand level controls for coffee makers or a dozen specifically designed PreDyne valves to control the flow of oil at a refinery. Choosing the right sensor for your manufacturing needs is more than just relying on a well-known brand. It’s also about finding the right type of sensor to fit your processes and your product. Managers might want to consider the media to be measured, the size of the vessel or tank, and even any temperature or pressure requirements. For instance, flow sensors aren’t appropriate for use in a septic tank, any more than a level control is meant to measure how much water apartment tenants use each month. In fact, we carry a full range of GEMS sensors types for monitoring fluid levels, pressurization, liquid flow, and temperature. Like GEMS, we make it a goal to provide quality products that solve a range of manufacturing challenges at competitive pricing. If you have questions or would like further information, don’t hesitate to contact us. We’d love to hear from you!